If you have stretch marks, I have good and bad news for you. The good news is there’s a good chance you can improve them, and you may even be able to get rid of them altogether. And the bad news is there’s a chance that you can’t noticeably change anything about your stretch marks. I’m not going to promise you can erase them with “weird tricks” or try to sell you worthless ointments or supplements. Scarring can be incredibly stubborn and many of us just have to learn to accept our imperfections and move on with our lives. The epidermis. This is the outer layer. The dermis. This is the middle layer. 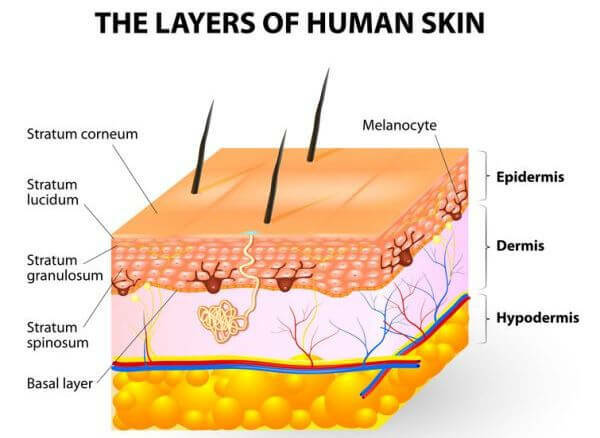 The hypodermis. This is the bottom (deepest) layer. The dermis contains strong connecting fibers that can stretch to adjust for normal levels of growth and shrinkage. A sudden and rapid enlargement or shrinking, however, causes the dermis to tear and deeper layers of skin to show through. These lesions eventually fade to a silvery white as the blood vessels contract and the fat underneath the skin becomes visible. There are non-mechanical factors to take into account as well. Research shows that high levels of cortisol, the body’s “stress hormone,” weakens fibers in the skin and increases the likelihood of stretch marks developing. Studies also show that there are genetic predispositions in play. Some people’s skin contains less DNA, protein, and elastin than others’, and this is associated with higher incidence of stretch marks. Oily marketers know that people are willing to try just about anything to get rid of their stretch marks, which is why there’s a cornucopia of “treatments” including creams, gels, lotions, scrubs, tonics, and supplements. Unfortunately, the majority of these products are consistently disappointing in their results. That said, research shows that some treatment options are more effective than placebos under certain circumstances, so let’s quickly review both the good and bad. Creams can help with skin dryness and reduce itching, but research shows they’re generally ineffective for reducing or preventing stretch marks. That said, there is evidence that the topical application of hyaluronic acid–which can be found in some stretch mark creams–can help prevent stretch marks. Cocoa butter is a fatty substance obtained from cocoa beans and it has long been a folk remedy for preventing stretch marks. Studies show that it doesn’t reduce the likelihood of developing stretch marks. Bitter almond oil is oil extracted from almonds produced by the bitter almond tree. A daily 15-minute massage with bitter almond oil. A daily application of oil with no massage. Control (no oil or massage). Researchers found that the massage with bitter almond oil reduced the development of stretch marks. Interestingly, applying the oil without the massage didn’t. If you want bitter almond oil, you can find it on Amazon. A study conducted by scientists at the University of Manchester found that subjects who massaged silicone gel into their abdomen daily for 6 weeks reduced stretch mark pigmentation. You can find silicone gel on Amazon. Research shows that applying olive oil to the affected area of the body doesn’t reduce the likelihood of developing stretch marks. That said, one study found that applying olive oil topically twice per day can reduce the incidence of severe stretch marks. Given the findings of the bitter almond oil and silicone gel research, I would be curious to see a study that involved olive oil plus massage (methinks there’s a good chance it would be more effective than a placebo). Retinoic acid is a compound derived from vitamin A, and it’s used in creams like Tretinoin to rebuild collagen in the skin and thus improve the appearance of early stretch marks (the pink, first-stage lines) and acne. Research shows that it’s effective for treating both stretch marks and acne, but it shouldn’t be used by pregnant or breastfeeding women because it can cause birth defects. Microdermabrasion is a process whereby crystals are blown onto the skin and vacuumed away, “polishing” its surface. It gently removes the top layer of the skin, which stimulates the growth of new, smooth skin. Research shows it can significantly improve the appearance of early stretch marks. Laser therapy uses different wavelengths of light to stimulate the production of collagen, elastin, or melanin in the skin. Studies show that laser therapy is a safe, effective way to improve the appearance of both early (red) and late (white) stretch marks. There are many types of lasers that can be used effectively, such as the 1,064-nm Nd:YAG laser, 1540-nm fractional nonablative laser, and 1550-nm fractional nonablative laser, so talk with your doctor as to which is most suitable to your condition. IPL is a skin therapy that involves, as you can guess, pulsing the skin with a high-powered light. Similar to laser therapy, the light and heat are used to destroy certain structures in the skin so they can be rebuilt. Whereas laser therapy uses only one wavelength of light, though, IPL uses filters to switch between a broad spectrum of wavelengths. Several studies show that IPL is a safe and effective treatment for reducing stretch marks. Gotu Kola is a medicinal plant that has been in use for hundreds of years. Research shows that regular topical application of Gotu Kola can improve a variety of skin conditions, including stretch marks, cellulite, and scarring in general. As you can see, if you have stretch marks, you have quite a few treatment options. Depending on which you choose, you should notice marked improvements within a few months of starting. This discussion wouldn’t be complete without addressing lifestyle, though. Avoid rapid increases and decreases in weight. Plan to gain weight slowly during pregnancy. Eat a nutritious diet (getting adequate vitamins A and C and zinc and silicone are particularly important for skin health). Drink enough water every day as this improves skin physiology. Exercise regularly (younger-looking skin is just one of its many, many benefits). What’s your take on how to get rid of stretch marks? Have anything else you’d like to share? Let me know in the comments below!